Under the effect of the gravitational collapse of a core heavier than 1.4 solar masses, the matter is forced into a degenerate state : electrons are unable to remain in their orbits around the nuclei (they would have to traver faster than light in order to obey the Pauli exclusion principle) and they are forced to penetrate the atomic nuclei. So they fuse with protons, and form neutrons. Pauli's principle, that we've seen before, forbids two neutrons having the same state to stay in the same place . This principle creates a degeneracy pressure fighting against gravity, and so allows the remnant of the star to find an equilibrium state. The result of this process is a so called 'neutron star', whose diameter is about 10 to 20 kilometers, weighting as much as the Sun. Its surface is like a hard and smooth ball, where the highest mountain is less than one micrometer. The surface of the star is mainly iron. a sugar lump of this matter weighs 400 billion tons. The Hubble Space Telescope succeded in taking an image of a neutron star located less than 400 light-years away from Earth. This star was previously detected by its Xray radiation, indicating a surface temperature around 700,000°. Its diameter is less than 28 km. The transformation of the atoms of the initial star into neutrons releases a tremendous amount of energy, corresponding to the binding energy of theses atoms. This energy is mainly radiated in the form of neutrinos, over a timescale of several tens of seconds only. The neutrino luminosity of such a supernova is typically 100 times its optical luminosity. Interaction between neutrinos and the matter is very weak, so they can emerge promptly from the core of the collapsing star, whereas the photons may take hours or days to emerge. Looking at the neutrinos can therefore give informations about the very early stages of core collapse. Following the explosion of a supernova, a neutron star is created with a temperature probably over 1000 billion degrees. It will rapidly cool in less than 1000 years, to 1 million degrees. After that, its temperature will decrease much more slowly. At its birth, this neutron star is recovering the rotation of the previous star, following the conservation of angular momentum . It will rotate at a very high speed. The Crab pulsar inside the nebula, for example, spins 30 times a second. Until recently, one supposed that a neutron star began by rotating at a very high speed, and slowed down with time. This scenario seems satisfactory for a lone star, but in the case of a binary system, where the companion is a small sized star, magnetic coupling effects with the forming accretion disk seems to cause a later acceleration of the spinning speed. Because the magnetic axis of the pulsar is not aligned with its rotational axis, the radio emission, generated by particles trapped in the magnetic field lines, will sweep across the sky, like a lighthouse beam sweeps across the sea. Some pulsars rotate a few hundred times per second. The rotation of a pulsar is exceedingly precise, and can be used as a cosmic clock. In particular, the system known as PSR 1913+16, made up of two pulsars, allowed the scientists to measure the very small effects of gravitational waves, predicted by general relativity. Neutron stars exhibit a very powerful magnetic field, anchored to their surface. This field comes from the magnetic field of the initial star, compressed by the collapse of the supernova. It is about 1012 Gauss, i.e. a trillion times more powerful than the Earth's magnetic field. The core of a neutron star is an electrical conductor, because it contains a trace of free electrons and protons. If the star is born rotating fast enough (at least 200 rev/second), the liquid core is able to start a "dynamo action" during the first 20 seconds or so, which is enough to enhance the magnetic field eight hundred to one thousand times (about 8x1014 Gauss). The magnetic field rotates with the star, being anchored to its surface. With such a strength, the magnetic waves and the related, magnetically-powered charged particles will carry off the star's rotational energy in a very efficient way, and suddenly brake its spinning movement. In some thousand years, the spinning velocity of the star will become as low as one revolution every five to ten seconds. Such a star is called a magnetar (contraction of magnetic star). When a magnetic field is this powerful, it can move material in the star's interior, and so apply very high stresses over the solid crust ; sometimes this crust can break, in the same way that the Earth's crust breaks in an earthquake under the stresses. At this time, the star ejects bursts of highly energetic particles, which will produce a brief, but intense emission of hard X-rays (the neutron star radiates at this moment as much energy as the Sun radiates in 1000 years). This radiation emission can repeat sporadically. This phenomenon is called : Soft Gamma Repeaters. Some magnetars radiate X-rays with a period of about ten seconds : they are called AXP : Anomalous X-ray Pulsars. This radiation comes from hot matter trapped inside the lines of the magnetic field, rotating with the star. After 10,000 years, the magnetic energy source in these stars begins to run down, and the magnetar slowly becomes invisible. It is possible that 10% of neutron stars are magnetars. Evolution of the spinning velocities of a lone neutron star compared to one in a binary system and to a magnetar. In fact, nobody really knows what can happen, because the theory about the strong interaction (which rules such an environment) under high density is not currently understood well enough. An hypothesis imagined in 1984 by the physicist Edward Witten would be the quark deconfinement, with the outbreak of a plasma of quarks u and d and gluons, under the effect of an external excitation - an high energy cosmic ray for example. This plasma is unstable and these quarks can desintegrate, giving now quarks s (strange). This core of quarks s and gluons is going to convert progressively the remaining neutrons of the star, to finally end in a total transformation (with a possible exception of a fine crust) in strange matter - so called, because mainly made up of quarks s . This very fast transformation, between one second and no more than ten minutes, leads to a "quark star", also called "strange star". Such a star is not ruled only by gravitation, but essentially by quantum chromodynamics (QCD). So, it has no minimal mass, and a radius proportional to its mass. A strange star would typically have a mass between one and two solar masses, and a radius about 10km, less than the radius of a neutron star. How to find a strange star ? The fact that the star has a crust or no leads to great consequences for observations : if the star does not have a crust, it will not emit any visible light. 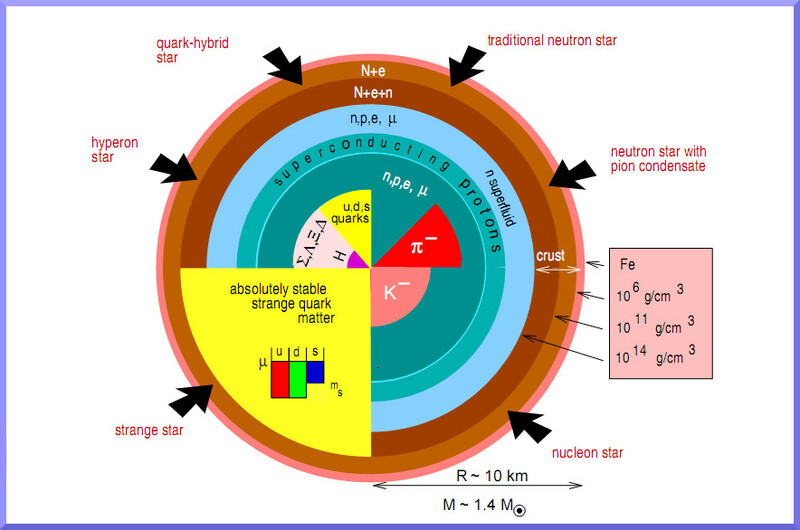 Conversely, if it has a crust of nuclear matter, its surface properties will be the same as a neutron star, and could for example to behave as a pulsar - a very fast pulsar because the radius of the star is less and the quark-gluon plasma is more viscous than the liquid of neutrons. Theoretical models forecast a faster cooling for a quark star than for a neutron star, but this could be questionned if a superfluidity phenomenon arises in the neutron star, drastically lowering its caloric value. 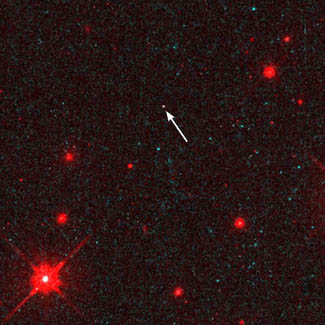 In 1996, the ROSAT satellite discovered an X-ray source, called RX J1856.6-3754 at about 450 light years of the Earth. Later measurements by the Chandra observatory seem to indicate a diameter of about 10 km for the star, too little for a neutron star. Obviously, this measurement is liable to doubt, the accuracy of measurement of such a little diameter at such a distance being very relative. Other similar neutron stars have been discovered since this one, but the measurement -indirect, of course- of their sizes is always very difficult and subject to many errors. At last, some astrophysicists are doubting about the very existence of strange stars, not on a theoretical point of view, but because of the lack of a simple and realistic scenario to create them. The conditions to create a black hole, as we are about to discover, are much easier to fulfill than the ones necessary to create a strange star.